In wintertime, I rely on simple, warming one-dish dinners – and risottos appear often on our dinner menu. They require so little clean-up, and the slow commitment to stirring the risotto as it cooks offers me a point of peace and meditative quiet. This version of risotto, is one of my favorites. 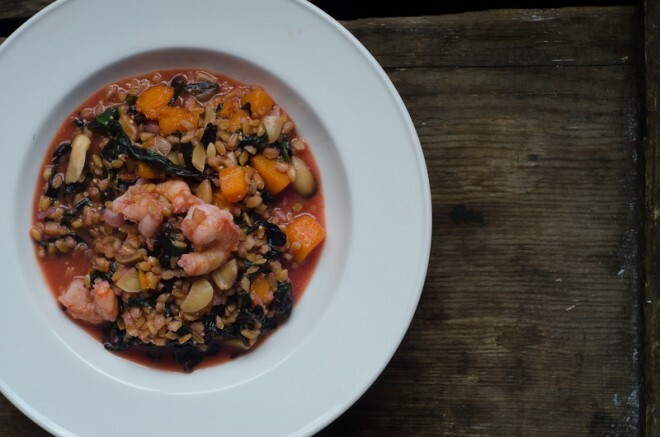 Instead of rice, I use einkorn wheat berries which give the risotto a wonderful chewiness, while almonds offer a crunch and both butternut squash and spot prawns contribute a touch of sweetness. 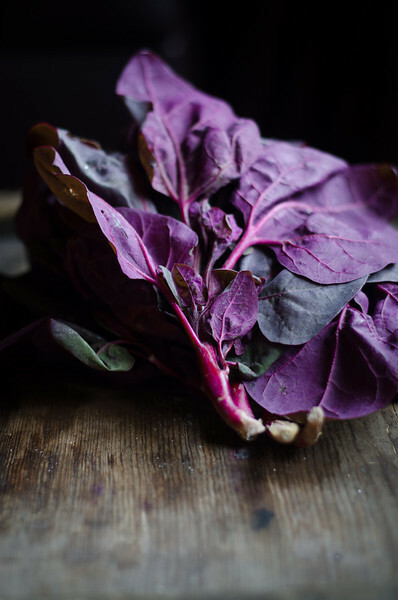 I often serve it with red orach, a leafy vegetable with a brilliant purple color that we often find in our CSA. The red orach colors the broth a lovely shade of pink, but if you don’t have it, simply substitute spinach. Einkorn is an ancient variety of wheat, and the first wheat to be cultivated by epi-paleolithic humans in what is now southeast Turkey. After its initial cultivation, einkorn spread throughout Europe, the Middle East and into north Africa. As a non-hybridized, heirloom variety of wheat, einkorn is richer in phytonutrients than modern wheat, higher in protein, and higher in antioxidants. Einkorn’s flavor is at once both simple and complex, richer and with a chewy texture and nutty taste when cooked. Like all grains, einkorn is best prepared by soaking it first in warm water for 18 to 24 hours. This helps to soften the grain to prepare it for cooking, and it also helps to facilitate the deactivation of food phytate, a component found in grains and pulses that can prevent full absorption of trace minerals. You can purchase einkorn online (see sources) as well as in well-stocked health food stores. Pacific Spot Prawns are small shrimp with a lovely sweet flavor. Like many varieties of shellfish, Pacific Spot Prawns are a good source of vitamin D, B vitamins and iodine. Particularly important in winter months when sun exposure is likely limited, vitamin D helps to support immune system health. U.S. and Canadian wild-caught spot prawns also remain one of the best choices available for readers concerned about sustainable seafood options. They’re ranked as “good alternative” and “best choice,” by the Monterey Bay Aquarium’s Seafood Watch Program. I purchase my seafood online, from a company that specializes in wild-caught, sustainable seafood. 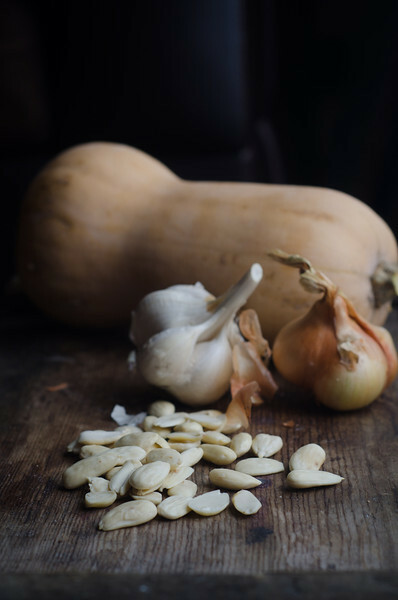 Along with einkorn and vegetables, bone broth provides the basis for this simple risotto. Bone broth is a favorite in the traditional foods community. It is rich in minerals, rich in gelatin and extraordinarily rich in amino acids. Unlike broth, which is made mostly from meat and boiled for a short period of time, and unlike stock, which is typically made from bones and boiled for a few hours, real bone broth is made by boiling bones and cartilage-rich joints often in excess of 24 hours, ensuring that the broth is a concentrated source of trace minerals, gelatin and other nutrients. You can learn more about bone broth here. We make bone broth weekly at home, both on the stove and in the slow cooker; however, if you do not have the time or do not wish to make bone broth, you can purchase it online and have it shipped to your door. A winter-time favorite, this risotto is spiked with garlic, shallot, butternut squash and Pacific spot shrimp (available here). Red Orach, a purple leafy vegetable often available at farmers markets or through CSAs, is added to the risotto toward the end, coloring the dish a faint pink. If you don't have Red Orach, substitute spinach. The night before you plan to cook the pilaf, place the einkorn wheat berries into a medium mixing bowl. Cover them with warm water, and stir in the apple cider vinegar. Allow the einkorn to soak, tightly covered, for 18 to 24 hours, then drain them in a fine-mesh sieve, rinse them well and set them aside. Warm the olive oil and ghee in a wide stainless steel or enameled cast iron skillet over medium heat. When the ghee melts and mingles with the olive oil, toss in the garlic and shallot. Fry them in the olive oil, stirring frequently to prevent scorching, for 3 to 5 minutes, or until they become fragrant. Stir in the almonds and continue cooking them a further 2 minutes, or until they begin to brown ever so slightly. Turn the down the heat to medium-low. Stir in the soaked einkorn, and stir into the garlic, shallot and almonds for 3 minutes. Stir in the butternut squash, and pour in the broth ½ cup at a time, stirring continuously with each addition, until the liquid is absorbed by the cooking grains, about 30 minutes. Stir in the spotted shrimp and the white wine, cooking until the shrimp curl under the heat of the stove, about 3 minutes. Stir in the red orach, and continue cooking until the liquid is largely absorbed by the grains, and the red orach wilts in the heat of the risotto. Adjust seasoning with salt, and serve warm. 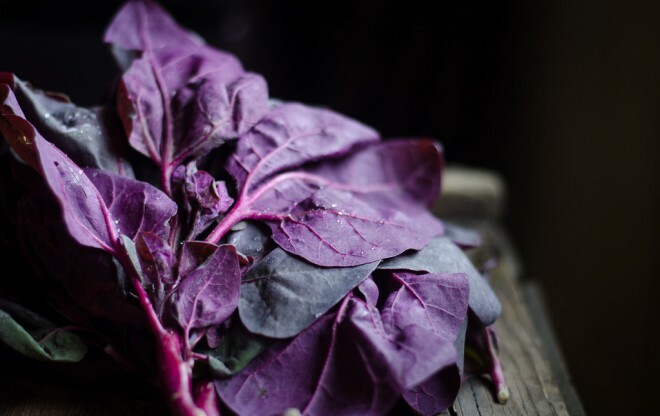 If you cannot find Red Orach, a purple-colored leafy vegetable with a flavor reminiscent of spinach, substitute spinach. Just beautiful, Jenny! I’ve been cooking more with einkorn berries and I do like the nuttiness in them. I’ll have to try this risotto as I just love the flavors you have going on. The recipe says to keep the einkorn berries tightly covered during soaking. Is covering tightly recommended just for this recipe or always when soaking einkorn and/or other types of grains? I don’t have any Einkorn berries, but I have organic spelt and organic soft wheat berries – can I substitute and still get a nice dish? Einkorn, spelt and emmer are known as “Farro” collectively. I think spelt would be a good alternative to einkorn in this recipe. I’d try that first before soft wheat, but I think either will work. Let us know what you decide and how it does for you. This was very deliscious. I didn’t have Eincorn so I substituted risotto rice. I now have Eincorn berries and can’t wait to try it again. I almost left the almonds out, but they contribute heavily to the dish. This will become one of those easy to prepare dishes for a busy day dinner. Loved it, thanks for sharing.